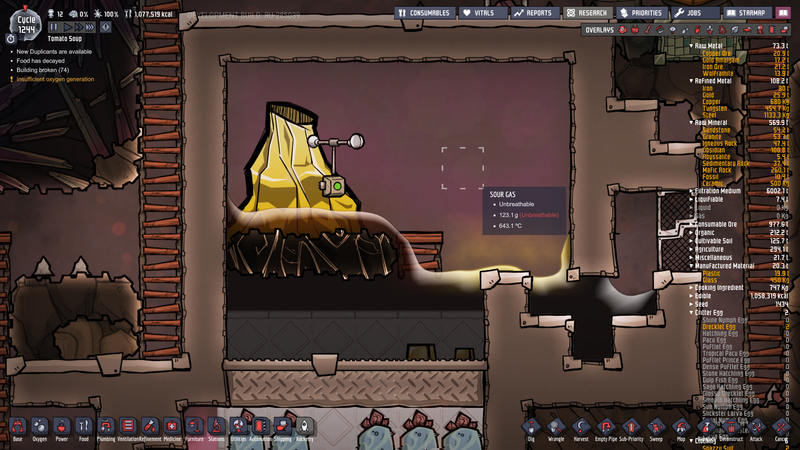 There's a bit of a longer description in the post here, but in short, I'm collecting gold from a volcano in a relatively cool pool of oil (currently between 85-100*C, well under oil boling point), while the rest of the room sits in vacuum. No problems for 30+ cycles. I check the room, a tiny bit of oil has turned to petroleum + sour gas. Reload the day, all fine again for some 10+ cycles. Then, I catch it turning oil into petroleum + sour gas again mid-eruption. I made a save during the eruption, but not before unfortunately. I reloaded the day, and the room stayed vacuumed through the eruption. You can see from the images/saves that it's exactly the same cycle, same time, therefore same volcano eruption, but one flash-boiled some oil to petroleum+sour gas, and the other didn't. The one extra wort on the picture should not make a difference, it was planted seconds before the screenshot was taken. It seems a bit too random to be intended, but I'm not sure. Seems like a bug, but I might be wrong. Really not sure - it happened maybe once in 30 cycles, and then again 10 cycles later. Reloading the day does not guarantee it will repeat. The savefiles are the best I can provide (unfortunately, neither before the eruption, both during). Molten gold is at 2500°C and oil boils at about 300°C. If at any time you have a tile of crude oil that only contains a few grams, it will boil because it will be on top and in direct contact of the molten gold. 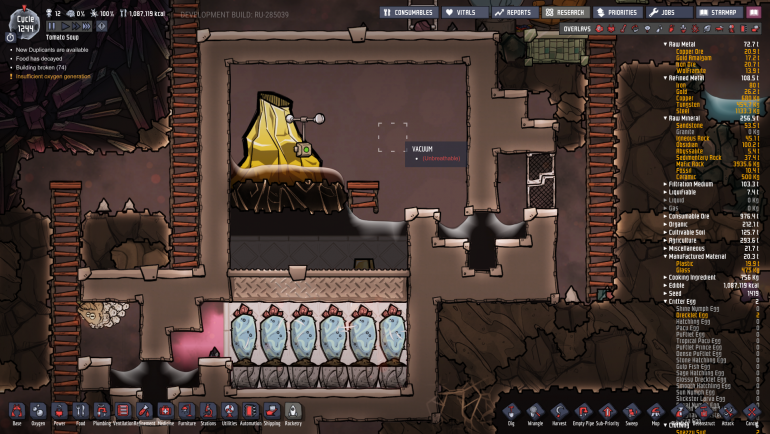 If I were you I'd make so crude oil tiles are at max capacity minus 10kg or so. So you are sure that any liquid movement created by molten gold dripping into crude oil creates a very small pocket of oil. I think that is why it has flashed into petroleum and then into sour gas. Your waterlock may be the source of this. Maybe molten gold has drip into it and flashed the few grams or you had on the left of your waterlock.